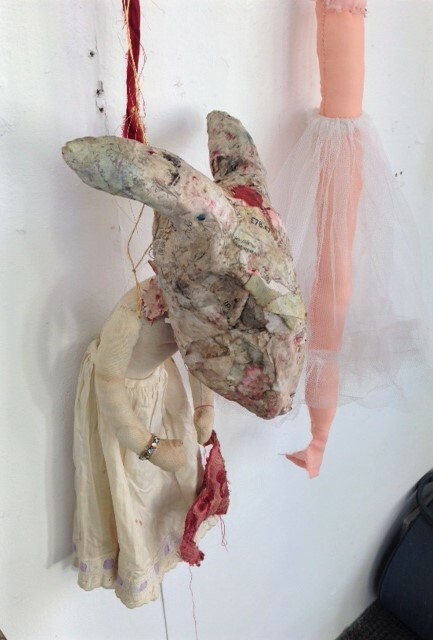 Jane Perkins | Art to make you smile! I have had a few comments/enquiries about the buttons so here’s what I’ve heard today… If anyone wishes to collect some buttons, it will need to be before next Friday. The contact number is on the factory link on previous Blog post. It turned out that what’s available to take at the moment is mostly in a skip at the front of the building, but he did give me a large bag of mixed black buttons. From the skip I retrieved quite a large amount of plastic buttons, mostly in neutral colours, and I also found some wooden toggles and a few wooden buttons that I think were samples. I also heard this today from Sarah (sister-in-law of factory owner) who made the original contact: Yes we’re overwhelmed by postal requests so people will need to come to the warehouse by Friday (15th) as we’re shutting up the warehouse and clearing by then. I’m so pleased that at least some will not be going to landfill. Good Luck everyone! “My brother-in-law’s company ‘A Brown & Co Buttons’ is closing down. 104 year old button company specialising in plastic, metal, glass, pearl (real and imitation) and wood buttons is sadly closing down. We have approx 30 tonnes of buttons that we really don’t want to send to landfill. This is a tragedy – a warehouse full of buttons about to go to landfill – has anyone any suggestions? As far as I’m aware, this is a first! 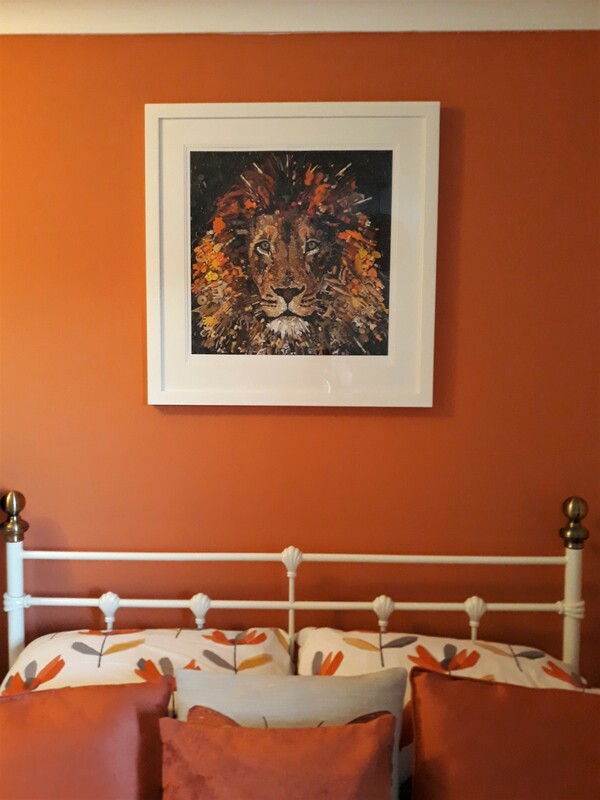 A lady recently purchased a print of Leonard but felt that her cream wall didn’t show him at his best. He needed a more vibrant background so she re-decorated the room to suit him beautifully. 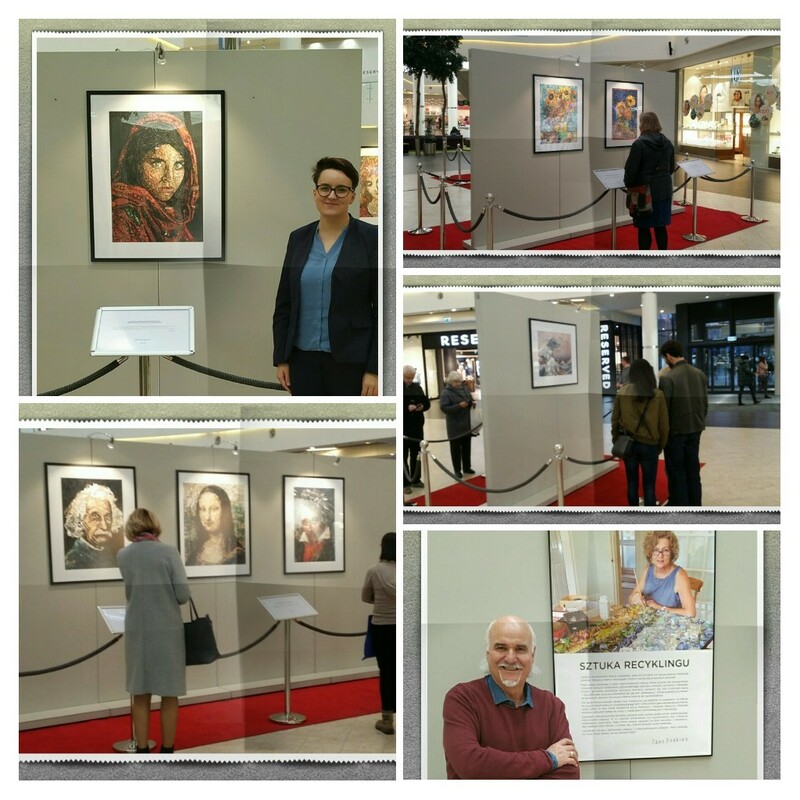 What an honour! Why does this appeal to me? I have no idea! 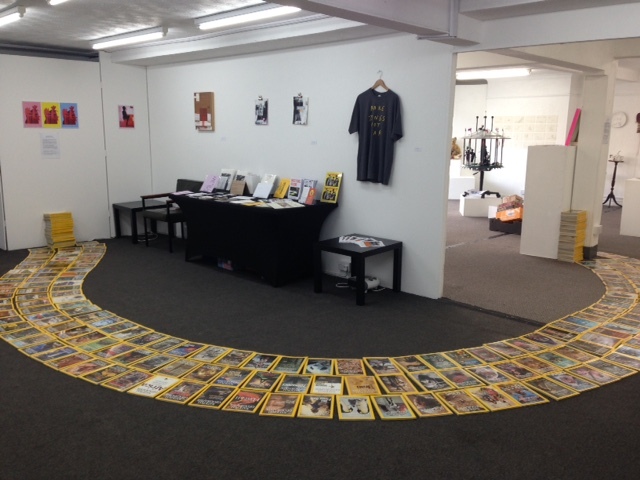 Here is my first ever piece of conceptual work in situ at TAAG, Teignmouth (until Mar 1st) – explanation beneath. There once was a man who subscribed for many years to National Geographic magazine. The magazines amassed, unopened and un-read. The man continued to subscribe (despite protestations from his wife), believing that one day, when old or struck by illness, unable to be active, the time would come when he would read them. And it came to pass. The man was diagnosed with cancer and in 2018, underwent six months of chemotherapy. Did he read the National Geographic magazines? No. By now, the man had a mobile phone, lap-top and Kindle. Life had moved on beyond imagination; beyond the Yellow Brick Road. 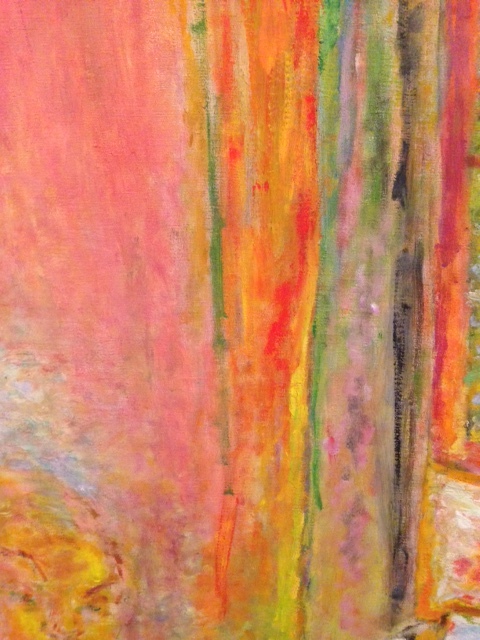 This week I visited the Bonnard exhibition at Tate Modern, London. 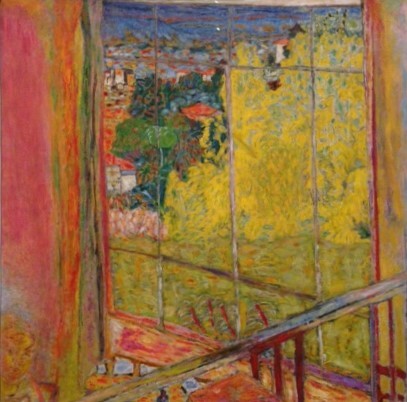 The work of the French artist Pierre Bonnard (1867 – 1947) doesn’t fit easily into any well-known genre. His loose, sketchy style in some ways resembles that of Monet (whom he knew) yet uses a vivid colour palette more like that of Matisse or Van Gogh. I’ve loved his work for a long time but had only seen images in books. When up close, I was surprised to see how roughly the paint was applied – in school one might have been criticized for ‘painting badly’ – yet they are masterpieces. 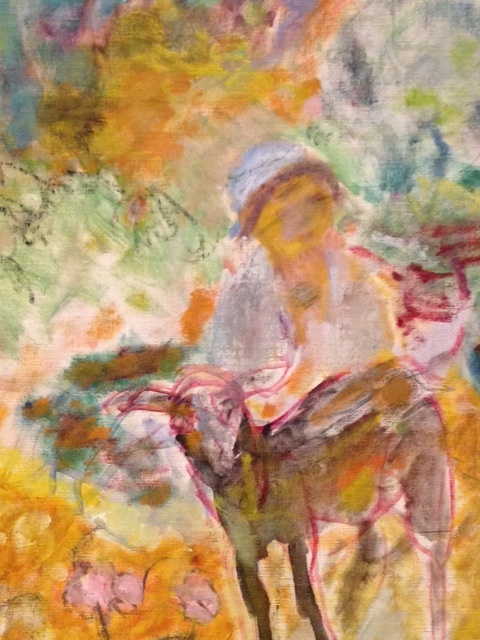 Bonnard created sensuous images of everyday life. He sketched outdoors but painted from memory in his studio. 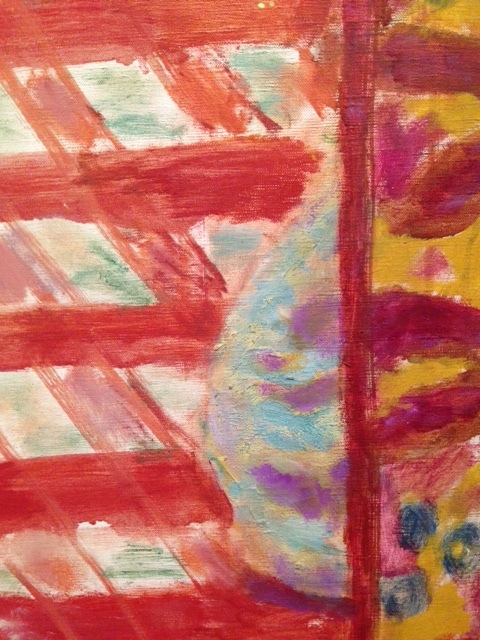 He often divided his canvases by horizontal, vertical or diagonal lines. Perspective is flattened and there are blocks of decorative pattern. 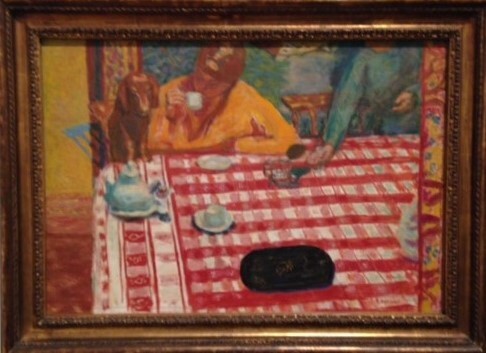 In the picture above, Coffee (1915) the tablecloth takes up most of the canvas while the head of the woman on the right has been cut off. The paint is applied roughly – almost scribbled on (see details below). 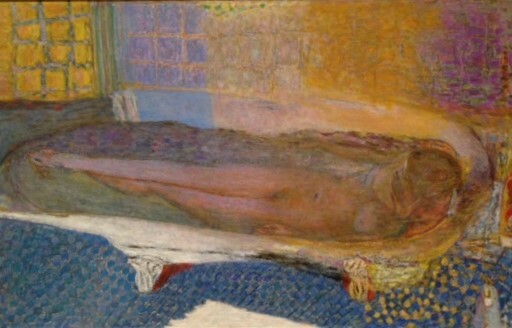 Bonnard included his wife Marthe in many of his paintings. An unconventional couple, they lived together for 30 years before marrying. Many paintings feature Marthe in the bath, always as a young woman and often surrounded by pattern and decoration. There are 100 works in the exhibition with an excellent audi-visual guide. Recommended!